In 28 years of Scholastic Games broadcasts, Elyria High School and Olmsted Falls High School have each won our annual championship five times. One of these schools will be eliminated from the running this year in this quiz program, which promises to be one of the most exciting competitions of the year. Returning to represent Elyria’s academic team are, as pictured left to right, Matthew Carson, Garrett Worden, and John Schumann. 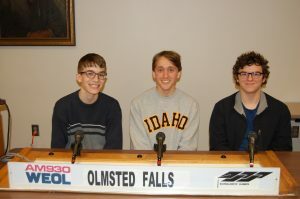 The Olmsted Falls team consists of, left to right, Harrison Graham, Ben Meredyk, and Nick Gaba. Graham is being heard for the first time on this broadcast. Schumann and Meredyk are former “Standout Scholar” winners. Click above to hear the broadcast (opening in a separate window is recommended), or to instantly learn the final outcome, you can read our official news release.